Patience Cavanaugh has lost hope in romance. The man she yearned to marry is dead and her dreams are gone with him. Now she is consumed with the restoration of a dilapidated boarding house in order to support herself. Despite her desire for solitude, Jedediah Jones, the local sheriff with a reputation for hanging criminals, becomes an ever-looming part of her life. 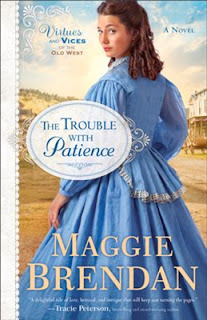 It seems like such a simple arrangement: Patience needs someone with a strong back to help her fix up the boardinghouse, and Jedediah needs a dependable source of food for himself and his prisoners. But Patience gets more than she bargained for as she explores the depths of the "hanging lawman"--and finds both betrayal and love. Purchase the book HERE. Maggie Brendan is the bestselling author of several books, including the Heart of the West series and The Blue Willow Brides series. Winner of the 2013 Laurel Wreath Award, she was a 2013 finalist for the Published Maggie Award of Excellence, a 2013 finalist for the Heart of Excellence Readers' Choice Award, a 2012 finalist for Inspirational Reader's Choice award, and a recipient of the 2004 ACW Persistence Award in Atlanta. She is a member of the Author's Guild; Romance Writers of America; Faith, Hope, and Love; and Georgia Romance Writers. When she's not writing, she enjoys reading, researching for her novels, and spending time with her family. You can follow her at her website www.MaggieBrendan.com.